A few summers ago, my brothers and I were riding mountain bikes on a red dirt logging road through the woods at the desolate tip of the Keweenaw Peninsula in Upper Michigan. All adults, we were on an annual bike riding vacation with no agenda. Then we found this. We had been riding for a few hours and the sun was still high when we passed a Jeep which was nearly standing on its grill, nose-down in the ditch by the roadside, almost completely obscured by trees and bushes. "Hey, let's take a look at this," one brother called out, in a tone of voice that meant he was going to stop and take a look. We hadn't seen another person in several hours, so we left our bikes in the middle of the road. One brother climbed into the Jeep which was missing its windshield and pretended he was driving it. Ken slid down the embankment beside the Jeep and looked at the front end. Ken owned an old Jeep and had probably seen his at a similar incline while out mud bogging with his four wheel drive club. This one had rolled before coming to a stop, since the top of the windshield frame was crushed, but there was no sign of blood and no body. "This guy didn't know what he was doing," Ken declared after going around and looking at the other side of the Jeep's front end. "No kidding," someone answered and we all laughed. "Are you suggesting that the driver of this Jeep could have gotten this out of here?" I asked. "This is a CJ with un-locking front hubs. The hubs are disengaged right now. When he got this stuck like this, you'll notice –" Ken pulled back a small sapling to give us a better view, "he spun the back tires but not the fronts. It didn't matter that he had the transfer case in four wheel drive." "So what?" I asked. I had owned a Jeep as well, albeit a modern one. "You couldn't drive this thing out. It's almost vertical." "If I had the keys, I could drive it out. Guaranteed." Ken was an engineer and often spoke with this confidence, and a tone of mathematical, provable certainty. "All four wheels are touching the ground." Ken is also the one who rebuilt the Hemi in our garage the summer after he graduated high school. "Hang on," one brother said, calling Ken's bluff. "Who needs keys?" 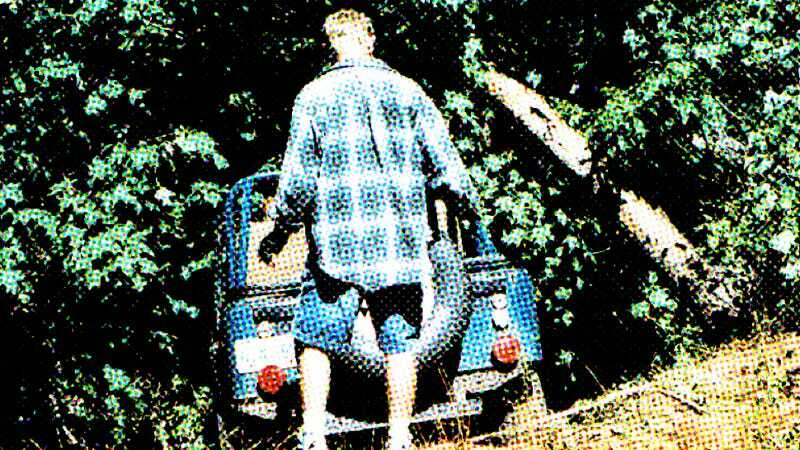 He climbed down the embankment and leaned into the Jeep. "If this is one of the old ones with the ignition in the dash instead of the column, we don't need keys." "It's in the dash." Ken didn't need to look, standing off to the side with his arms crossed. The brother challenging Ken poked through the debris on the floor of the Jeep. "I need a paperclip and a screwdriver or a knife." He found them. We all stood around as he played with the ignition, poking the two implements delicately into the slot. Ten seconds later the starter was cranking. He pumped the gas but the Jeep wouldn't start. "Hang on — Don't kill the battery." Ken said loudly, over the sound of the starter. We all stood and gaped at the brother in the driver's seat, impressed that he'd gotten the engine to turn over. "Do you think he may have disabled it when he left it, in case someone came along before he got back?" someone asked. "Someone like us?" We all laughed. "Pop the hood and check the wiring. And smell for gas to see if it's flooded." I walked around front and undid the clips that held the hood in place. We raised it and began checking the engine compartment. Someone yelled out, "There are tow straps back here. Should we hook them up so we can pull on it when we're trying to drive it out?" Someone up front thought it would be a good idea so we hooked the straps up to the rear bumper. "Got it," someone called out from beneath the hood. He pointed to the coil and its two terminals, where one terminal had no wire attached to it. "What's supposed to be connected here?" "Hang on," Ken reached around under the engine and pulled out a wire. "Hook that up and I bet she'll start." We undid the nut on the post and fastened the wire. The starter cranked again, the driver's hand on the paper clip and one on the screwdriver. The Jeep started. Ken scrambled around and locked the hubs in place on the front wheels. The rest of us climbed up the steep embankment and grabbed the tow straps as someone moved the bikes out from behind the Jeep. One brother was behind the wheel; four of us would be pulling on the tow straps. The engine revved. All four wheels began to spin and the Jeep moved a few inches up but then he let off on the gas and the Jeep settled back down. "Are you sure this will work?" I asked Ken. "I've driven out of worse without four guys pulling on a tow strap." He yelled, "Just gun it and don't let off next time." He revved the engine even higher this time and the wheels began spinning as the clutch engaged. The Jeep crept a few inches and as we pulled to keep it from slipping back down into the ditch, the wheels grabbed and the Jeep lurched out of the ditch and onto the road. We dropped the straps and jumped out of the way. There, in the middle of the road sat the Jeep in a cloud of red dust. I grabbed my camera and took a few photos. If I hadn't, no one would have believed this story was true. Except for the waitress at the restaurant in town. We asked her if she knew who owned the old greenish-blue Jeep we had seen around town. "That's my brother's. Why?" She looked at us as if we could answer a question which had been bothering her. "We saw it out in the woods earlier today. Where is he right now?" A look of relief crossed her face. "He came home really late last night. Walking. He's working at the store at the end of town." After lunch we walked over and found him. He was behind the counter, talking on the phone to a tow truck driver in a town 35 miles away. We introduced ourselves and asked about the Jeep. "Yeah, we were goofing off last night and I put it in the ditch." He looked remarkably healthy for a man who had rolled a Jeep and then walked several miles home, probably still drunk. "Well, good news. We pulled it out of the ditch for you. You don't need a tow truck." He looked confused. "How did you guys do that?" We didn't want to tell him about the chicanery. "The five of us saw it in the ditch and saw the tow straps. Hope you don't mind but we just put it in neutral and muscled it out." He didn't believe us. "That's impossible." "No it's not. Go look. We saved you a couple hundred dollars." He had no choice but to believe us. After all, the Jeep WAS out of the ditch and he still had the keys.